California gubernatorial candidate Travis Allen speaks during the state Republican Party convention in San Diego earlier this month. Antonio Villaraigosa went to South Los Angeles earlier this month to thank African-American political, religious and community leaders for their endorsements. 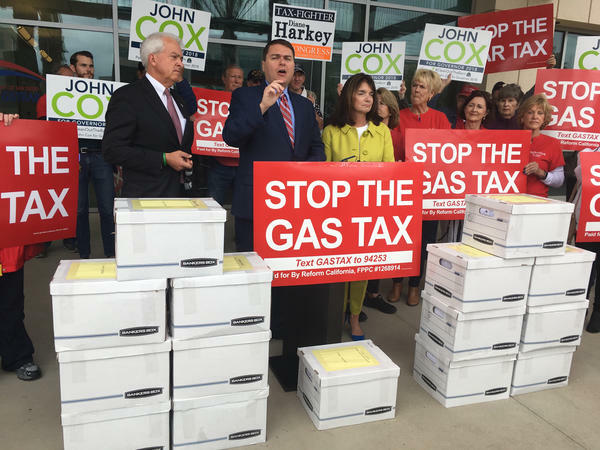 Republican gubernatorial candidate John Cox (left) and organizer Carl DeMaio (center) lead a petition drive last month to repeal California's gas taxes and vehicle registration fees. It's rare that a candidate for public office would be happy to come in second. But that is the case in the governor's race in California. There has been no question about the front-runner. Lt. Gov. Gavin Newsom, former San Francisco mayor, has led in every poll. But that doesn't just affect his fellow Democrats. California has an open primary, which means that every candidate from every party competes on the same ballot. The top two finishers, regardless of party, go head-to-head in November. The great fear among Republicans is that they could be shut out entirely. The number of California voters registered as Republicans has declined steadily over the years. They're now just 25 percent of the electorate. So if Republican voters are divided, a Democrat could claim second place. No one would like to see that more than Antonio Villaraigosa, the former mayor of Los Angeles. He has been shoring up his support in familiar places. Recently he was in South L.A. to thank African-American political, religious and community leaders for their endorsements. "This community opened up a door for me," said Villaraigosa. "I never would have been mayor of Los Angeles if in 2005, we hadn't had an outpouring of support [here] and I never forgot that." Villaraigosa has never run for a statewide office before. So he has also been campaigning and raising money in California's agricultural Central Valley, not usually fertile soil for Democrats. Some polls have shown him in second place, some in third, one in fourth. He hasn't held public office for five years. But his name recognition is likely to rise, courtesy of millions of dollars in independent expenditures from wealthy advocates of charter schools. Sharing second, third and fourth place in the polls with Villaraigosa are two Republican candidates. John Cox is a businessman from Chicago who has never held elective office, though he has run for several of them. 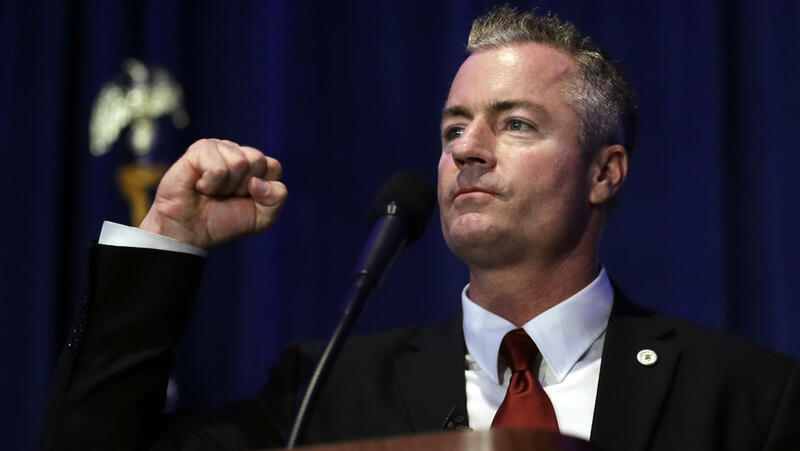 His Republican rival is state Assemblyman Travis Allen, who touts his Southern California roots and his love of surfing. At the state GOP convention in San Diego last weekend, Caroline Abate stood outside the hall waving signs for both Cox and Allen. "Endorse somebody!" she pleaded with delegates. Republicans need to choose one of these guys, Abate said, and she didn't seem to care which one. A party endorsement will unify Republican voters, she said, because "if they split the vote, Antonio Villaraigosa is going to get No. 2 ... and it's going be over for Republicans in June." On paper, Cox and Allen seem to check the same boxes. They both support President Trump's plan for a border wall. They both want to repeal the recent California law that protects undocumented immigrants. They both want to dump an increase in the tax on gasoline. Their big differences are in style. John Cox looks every bit the distinguished, older business executive, and he sees the state through that lens. He told convention delegates that California has been mismanaged and that it'll take a businessman to fix it. "Businesspeople solve problems," said Cox. "[They're] not a bunch of rhetoric, not a bunch hot air. They get results and that's what people want." While Cox is using part of his personal fortune to fund his campaign, his opponent Travis Allen's campaign is running on fumes. Allen tries to make up for it with boundless confidence and by touting his early and passionate support for Donald Trump, whom Cox did not vote for. "Did we take back our country in 2016?" Allen asked to the cheers of the crowd. "Are you ready to take back our state in 2018?" In the end, neither Allen nor Cox could muster enough support to win the party's endorsement. It looks like they'll be fighting for the same dwindling pool of conservative voters until primary day, decreasing their chances of making the runoff. Delegate Karen Roseberry found that prospect alarming and begged the delegates to reconsider. There is so much more at stake she said, than just the governor's race. "Every down-ticket race is counting on this," she said. "We need a Top 2 finisher in November and that comes when the party is united." Those down-ticket races worrying Roseberry include at least half a dozen vulnerable Republican House seats. If Democrats can grab those, it would help them tip the balance of power in Congress. No one knows what the impact on Republican turnout will be if there are only Democrats to choose from in the California governor's race. But Republicans are hoping they won't have a chance to find out. It's rare that a candidate for public office hopes for second place, but that's what's happening in California. The state holds an open primary next month. And that means the top two candidates, regardless of their party, will go to a runoff in November. In super blue California, Republicans fear they will have no candidates in the runoff for governor for the first time. And if that happens, the impact could extend from the statehouse in Sacramento to Capitol Hill in Washington. NPR's Ina Jaffe reports. INA JAFFE, BYLINE: If the November election comes down to just two Democrats vying to be governor of California, that'll be a victory for former Los Angeles Mayor Antonio Villaraigosa. Recently he was on familiar turf in South LA thanking African-American community leaders for their endorsements. ANTONIO VILLARAIGOSA: This community opened up a door for me. I never would've been mayor of Los Angeles if in 2005 we hadn't had an outpouring of support there. And I never forgot that. JAFFE: The clear front-runner in this race is Democratic Lieutenant Governor Gavin Newsom. 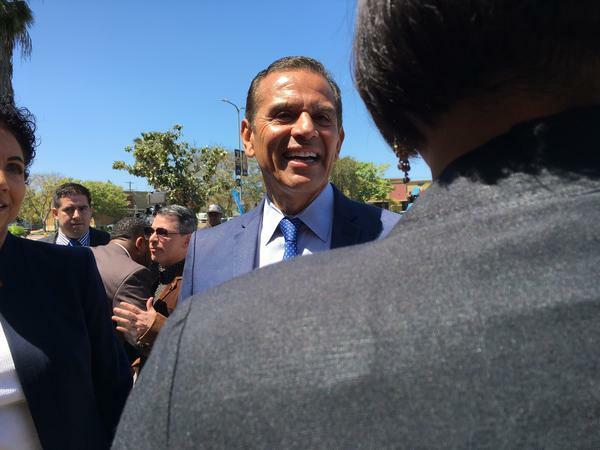 Polls show Villaraigosa in second place, or sometimes third or even fourth. But his name recognition is likely to rise courtesy of millions of dollars in independent expenditures from a few wealthy backers. And those resources have Republicans worried. Their party has been steadily declining in California and now claims just around a quarter of the state's registered voters. CAROLINE ABATE: Endorse somebody. Don't leave without endorsement. Show party unity. JAFFE: Caroline Abate was at the state Republican convention in San Diego over the weekend waving signs for both GOP candidates. That's businessman John Cox and State Assemblyman Travis Allen. She said convention delegates need to officially endorse one of them. ABATE: If they split the vote, Antonio Villaraigosa's going to get number two. So it's going to be over for the Republicans in June. JAFFE: On paper, Cox And Allen check a lot of the same boxes. They both support a border wall. They both want to repeal the recent California law protecting undocumented immigrants and another one raising the gas tax. Their big differences are in style. John Cox sees the state through the lens of a business executive. He told delegates that California's been mismanaged, and it'll take a businessman to fix it. JOHN COX: Businesspeople solve problems. They're not a bunch of rhetoric. They're not a bunch of hot air. They get results. And that's what people want. JAFFE: While Cox is pouring part of his personal fortune into his campaign, Travis Allen's is running on fumes. He compensates with enthusiasm and his passionate support of President Trump. TRAVIS ALLEN: Did we take back our country in 2016? ALLEN: Are you ready to take back our state in 2018? JAFFE: Neither Allen nor Cox could muster enough support to win the party's endorsement, so they'll likely be fighting for the same dwindling pool of conservative voters, decreasing their chances of making the runoff. Delegate Karen Roseberry found that alarming. There is so much more at stake, she said, than just the governor's race. JAFFE: Those down-ticket races that worry Roseberry include at least half a dozen vulnerable Republican House seats. If Democrats can grab those, it would help them tip the balance of power in Congress. No one knows what the impact on Republican turnout will be if there are only Democrats to choose from in the California governor's race. But Republicans are hoping they won't have a chance to find out. Ina Jaffe, NPR News. (SOUNDBITE OF CHARLES MINGUS' "FAREWELL FAREWELL") Transcript provided by NPR, Copyright NPR.